DirectRoute (Tuam) Limited along with their Operation and Maintenance partners A-Way and Lagan (ALIS) recently took part in Society of St. Vincent de Paul's (SVP) annual appeal. A 'Giving Tree' was set up at the maintenance depot where employees chose a tag and bought a gift for the child or adult on their tag. A food appeal was also launched where various food items were collected. We were delighted to receive such fantastic support for such a worthy cause, especially at Christmas time. 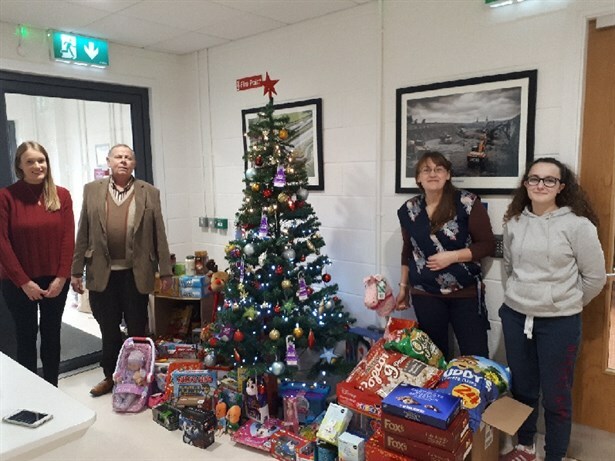 DirectRoute (Tuam) Limited also donated toys and food to the value of over €500 to SVP. All gift and food items will be distributed by SVP to local families in need, just in time for Christmas. Last year SVP Volunteers visited approximately 50,000 families over the winter and they expect to visit at least the same number this year. As Christmas approaches, they are receiving over 1,00 calls a day to their offices around the country. SVP offer direct, personal assistance that is non-judgemental and based on the need of the individual family. In addition, they provide a wide range of services for vulnerable people through their local offices, shops, resource centres, day care and holiday schemes amonst other things. If you wish to make a donation to SVP, you can do so on their website www.svp.ie. Society of St. Vincent de Paul is a registered charity - CHY 6892. 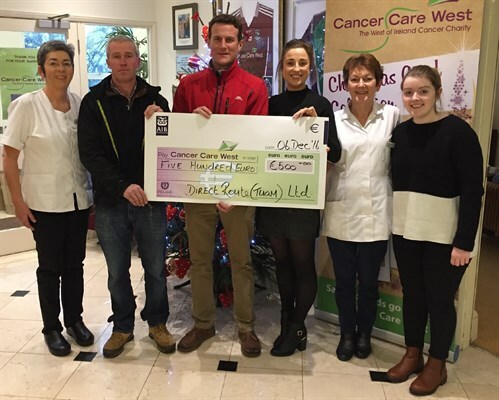 DirectRoute (Tuam) Limited recently made a donation to Cancer Care West, arising from its 2018 Program for Social Initiatives on the Operation and Maintenance phase of the M17/M18 Gort to Tuam project. Cancer Care West is dedicated to providing the best support to persons affected by a cancer diagnosis in a safe, encouraging and accessible environment. 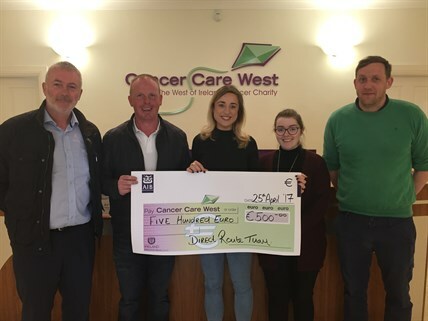 Cancer Care West provides its services to its residents in accompaniment to medical treatment through the provision of accommodation in Inis Aoibhinn Lodge and support services in the Cancer Support Centre. The lodge, situated on the grounds of the University Hospital Galway, offers accommodation to patients undergoing radiotherapy treatment at UHG and includes facilities for a patients's family member or guest to share. The Cancer Support Centre offers an extensive variety of services, available free of charge to anyone affected by cancer - patients, carers, family members and close friends. Patient support is the fundamental focus of Cancer Care West. Its main priorities are to equip people living with cancer with the practical and emotional support they need to maintain a peace of mind and quality of life. Cancer Care West also provides cancer awareness and educational programmes and supports research into patient care. Cancer Care West is a registered charity - CHY 11260. 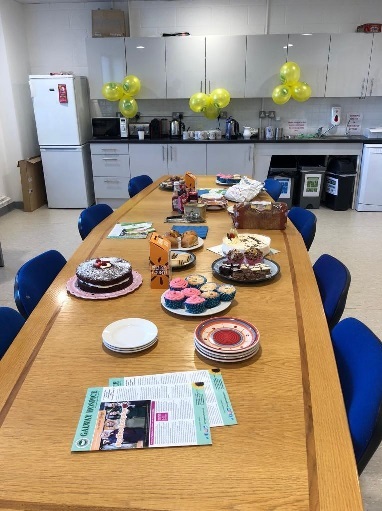 On the 16th October 2018, DirectRoute (Tuam) Limited, along with their Operation and Maintenance partners A-Way and Lagan (ALIS) held a Coffee Morning, raising over €200 for Galway Hospice. Following the Coffee Morning, DirectRoute (Tuam) Limited donated €500 to the Hospice arising from its 2018 Program for Social Initiatives on the M17/M18 Gort to Tuam Project. Galway Hospice Foundation provides a wide range of fully- accredited specialist Palliative Care Services to adults and children with cancer and other life-limiting illnesses, as well as providing support to their families and carers. These services which include Home Care, Inpatient Care, Day Care, Bereavement Support and Education, are delivered across Galway city and county and the adjoining islands. The Hospice depends on voluntary contributions of €2 million to ensure the free availability of services to those that need them. A fundraising campaign like Coffee Morning is, therefore, extremely important in terms of sustainable fundraising. Demand for hospice services continue to grow. The Hospice's plans for a new 36-bed state of the art Hospice at Merlin Park are progressing and a planning application for the new facility was approved in August. The target is to have the facility completed within the next five years. The next step is to complete a more detailed design of the proposed building with a view to preparing tender documentation. This will take between six and nine months. Galway Hospice is a registered charity - CHY 8837. DirectRoute (Tuam) Limited recently donated to Galway Simon Community, arising from its 2018 Program for Social Initiatives on the Operation and Maintenance phase of the M17//M18 Gort to Tuam Project. Since 1979, Galway Simon Community work with people in the areas of homelessness prevention, housing and health & well- being. The Galway Simon Community take a housing first approach. Their work is focused on preventing people from becoming homeless by keeping people in their own homes or helping to resettle people to a new home through mainstream housing. 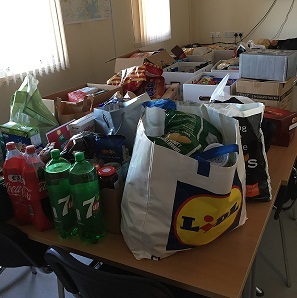 This donation will be placed into their 'Essentials Fund', which is a fund set up by Galway Simon Community in 2016 in response to the increasing number of individuals and families who were at risk of losing their home and who were turning to them for help. The fund supports basic costs which could have an impact on a family or individual's capacity to sustain their home. The fund provides practical assistance on an expedited basis, to allow those at risk of, or experiencing homelessness to bridge the gap between funds they have, and the costs incurred in securing accommodation in the private rental market. Practical items associated with moving into a new home are supported through the fund such as bed linen, a first week's groceries or kitchenware and rental deposits. These essentials enable individuals and families to get back on their feet in a time of crisis. Galway Simon Community works tirelessly to help people who find themselves in a difficult position. 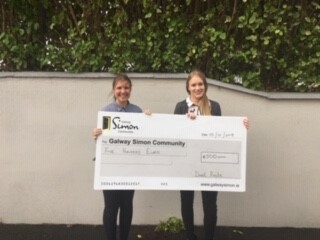 So far this year, Galway Simon Community have already helped 445 unique households across their homelessness prevention and housing services. If you would like to donate to the Galway Simon Community, you can do so on their website www.galwaysimon.ie or by contacting 091-381828. 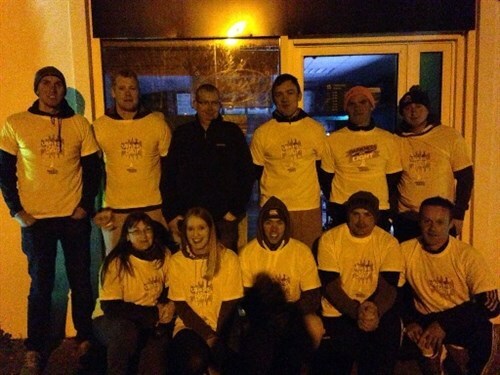 In the early hours of 12th May 2018, DirectRoute (Tuam) Limited along with their Operation and Maintenance partners A-Way and Lagan (ALIS) completed the Darkness into Light walk - a global movement to raise awareness and funds for the prevention of suicide and self-harm. Now in its 10th year, the charity walk took place in 180 venues across Ireland and worldwide. 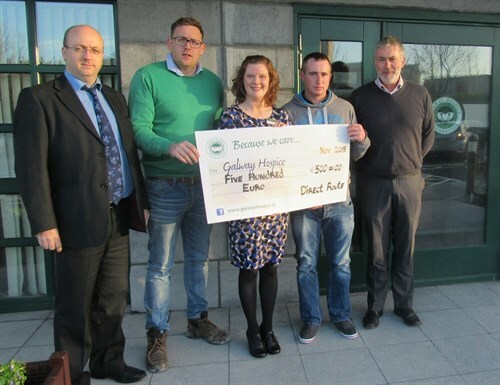 Funds raised from the walk will go towards Pieta House's counselling services. 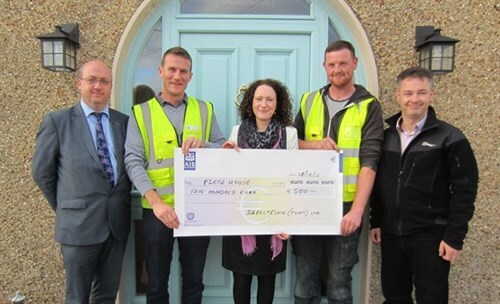 Following this walk DirectRoute (Tuam) Limited made a donation to Pieta House West arising from its 2018 Program for Social Initiatives on the M17/M18 Gort to Tuam Project. Pieta House West is a suicide and self-harm crisis centre based at Bishop Street in Tuam that serves the whole north-west region. The centre has fully qualified staff providing a professional, one-to-one therapeutic service for people who are experiencing suicidal ideation or engaging in self-harm. Anyone can access the service; it is completely free of charge and a doctor's referral or psychiatric report is not required. Most people are referred to Pieta House by family members or friends. In the event that anyone is in need of the services offered at Pieta House, whether it is yourself or someone you know, all approaches are dealth with in complete confidentiality. Should you wish to contact Pieta House West the number is 093 25586 and opening hours are Monday, Tuesday Thursday and Friday from 9am to 5pm, Wednesday 9am to 8pm and Saturdays 10am to 2pm. A new centre has recently opened in Merchants Road in Galway City. 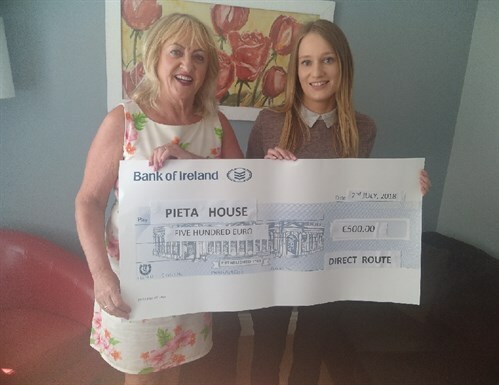 Pieta House is a registered charity (CHY16913) and relies heavily on the support of the public to provide this dedicated and specialised support. Further information on Pieta House West and the services provided by Pieta House in general can be veiwed at www.pieta.ie which includes a click and donate facility should you wish to make a contribution. DirectRoute (Tuam) Limited recently donated to the Autism Spectrum Disorder Unit, Clarin College, Athenry, arising from The Program for Social Initiatives for 2018 on the Operation and Maintenance phase of the M17/M18 Gort to Tuam project. The Autism Spectrum Disorder classroom (ASD) was opened in 2011. The purpose of the ASD class is to assist students with ASD to leave school with the skills necessary to participate in an inclusive way in society and to live independent and fulfiled lives. Clarin College places great emphasis on developing each student to their full potential and are mindful of the need to assist them in developing their communication, social, behavioural and general life skills. The school recognises that pupils on the Autism Spectrum may have additional difficulties which necessitate the adaption of the courses of study prescribed in the Department of Education Curriculum. This may mean a greater emphasis on certain areas of need for these students e.g communication, social development. A close partnership with parents play a key role in enabling students who attend the ASD class to achieve their potential. Classes take the form of supported/unsupported mainstream inclusion, classes involving curricular support or classes unique to the ASD programme such as non-curricular Literacy and Numeracy skills, Music, swimming, Physical Education, meditation, direct social skills training, personal care, Occupational Therapy and Speech and Language Therapy. The ASD class setting promotes students with ASD to engage with their peers. There is a 'Reverse Integration' practice whereby Transition years visit the ASD class for a structured social class. This is important in developing positive relationships with their peers. Students with ASD bring a great richness to school life as they teach their peers the importance of fulfilling ones' potential regardless of personal circumstances. Students with ADS teach other students how to get along well with people who are different from them. This helps to combat stereotypes about people with disabilities and encourages students to embrace diversity and respect those who have challenges outside of their experiences. 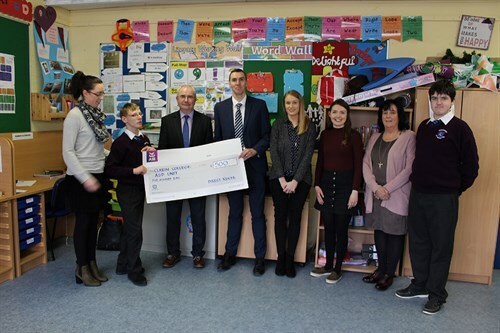 L-R: Ann Lynn (Teacher), Ivan Eagle (Student), Ciaran Folan (Principal), Niall Lyons (DirectRoute), Fiona Doherty (DirectRoute), Trina Duane (Teacher), Clare Conneely (Teacher), Brian Dolan (Student). 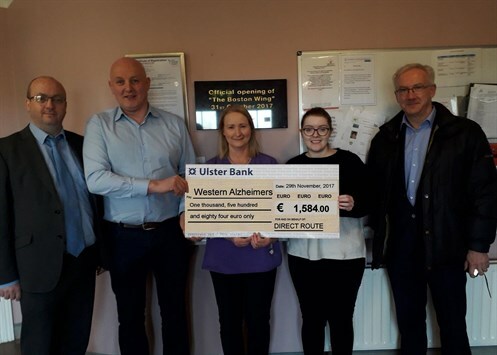 DirectRoute recently made a donation to Western Alzheimers, arising from the M17/M18 Gort to Tuam Motorway Cycle in which four members of the DirectRoute team participated and raised much needed funds for Western Alzheimers. Western Alzheimers is a charitable organisation that provides a complete service of care to families affected by Alzheimers/Dementia in the West of Ireland. Western Alzheimers supports hundreds of families with a 'home from home' philosophy and ensures that people living with Alzheimers are cared for in a safe, comfortable and nurturing environment. Western Alzheimers offers supports and facilities to the families of people living with Alzheimers which include Long Stay Residential Care, Respite Care, Day Care and In-Home Care in Galway, Mayo and Roscommon. Western Alzheimers are funded through state support from the HSE and DSP, fund raising activities and philantropic contributions. If you would like to donate to Western Alzheimers, you can do so on their website www.westernalzheimer.ie or by contacting their offices in Galway, Mayo or Roscommon. You will also find Western Alzheimers on Facebook. Western Alzheimers Company registered number is 244419 and the registered charity number is 11416. L-R: Declan Carney (DirectRoute), Pat Holmes (Western Alzheimers), Dympna Dolan (Western Alzheimers), Nadine Monaghan (DirectRoute), John Crowley (DirectRoute). 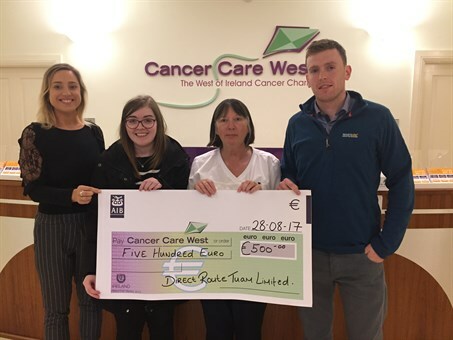 DirectRoute recently made a donation to Cancer Care West, arising from the Health and Safety incentive on the M17/18 motorway project. The lodge, situated on the grounds of University Hospital Galway, offers accommodation to patients undergoing radiotherapy treatment at UHG and includes facilities for a patient's family member or guest to share. The Cancer Support Centre offers an extensive variety of services, available free of charge to anyone affected by cancer - patients, carers, family members and close friends. Patient support is the fundamental focus of Cancer Care West. Its main priorities are to equip people living with cancer with the practical and emotional support they need to maintain a peace of mind and quality of life. Cancer Care West also provides cancer awareness & educational programmes and supports research into patient care. If you wish to make a donation to Cancer Care West, you can do so on their website www.cancercarewest.ie. Alternatively, you can contact Cancer Care West on 091-545000 or by emailing [email protected]. L-R: Rachel Dooley (Cancer Care West), Nadine Monaghan (DirectRoute), Doreen Garvey (Cancer Care West), Ciaran Blake (Sisk). DirectRoute recently made a donation to the Jack & Jill Foundation, arising from the Health and Safety incentive scheme run on the M17/18 motorway project. 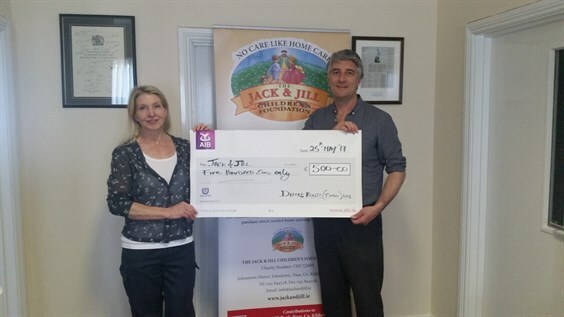 The Jack & Jill Foundation was set up in 1997 and provides nursing care & support for children with severe neurological development issues, as well as offering some respite to the parents and families of the sick children and end of life care. The Jack & Jill Foundation provides home respite for children up to 4 years of age who suffer from severe developmental delay and associated problems. It provides direct funding to parents enabling them to purchase specialist care. The Foundation funds a maximum of 64 hours of home nursing per calender month, per family and they cover all 26 counties. The services the foundation provide include the following: Home visit by a Liaison Officer/Nurse, Advice for caring for a child at home, Advice & Information on how to access all the services a child may require, Listening to what the parents want for their child and make representations on their behalf, as well as many more. The Foundation currently has 305 babies and their families under their care in every county in Ireland and are taking new referrals each week. Since the foundation was set up in 1997, they have bought succour to over 2100 children and their families. If you would like to donate to the Jack & Jill Foundation, you can do so by visiting their website www.jackandjill.ie or by contacting 045-894538. 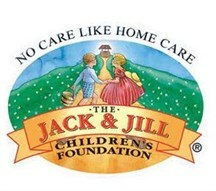 The Jack & Jill Foundation is a registered charity - CHY No 12405. 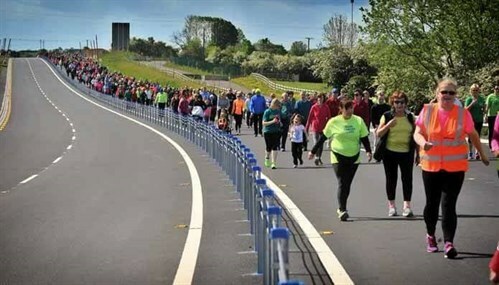 The recent walk and run on the Tuam Bypass was a roaring success as just under 1,000 people participated and donated an amazing sum of over €9,700 for Tuam Cancer Care. DirectRoute would like to thank everyone that participated and gave so generously to a great cause. 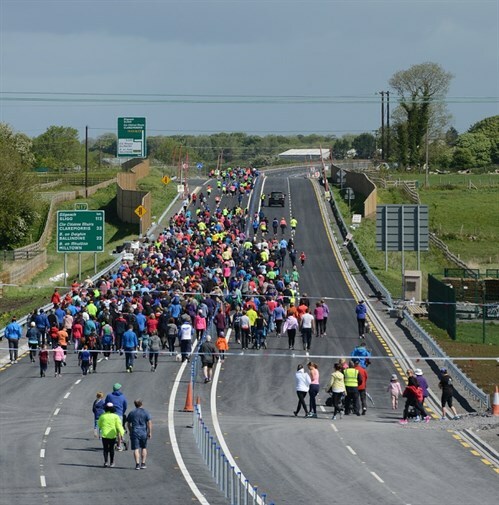 We would also like to thank Tuam Cancer Care for organising the event in what was a relatively short period of time and to Roadbridge who prepared the area in advance to ensure that the event passed off safely and without incident. For further information on Tuam Cancer Care and the services they provide you can check them out at www.facebook.com/tuamcancercarecentre and their website www.tuamcancercare.ie. You can also contact the centre on (Tel) 093-28522 or email [email protected]. 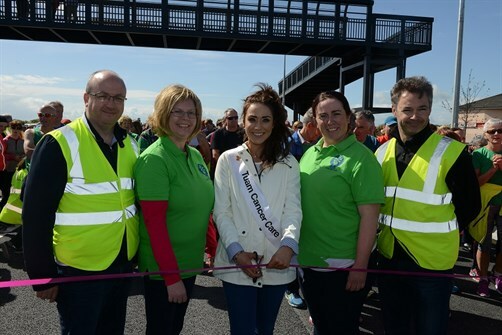 Tuam Cancer Care Rose Amy Geoghegan cut the tape for the walk/run with L-R Declan Carney (DirectRoute), Maureen Grealish and Eimear Keane (both Tuam Cancer Care) and Paraic McCarthy (Roadbridge). Cancer Care West is committed to providing the best support to anyone affected by a cancer diagnosis in a safe, nurturing and accessible environment. Cancer Care Wet provides its services to its residents in accompaniment to medical treatment through the provision of accommodation in Inis Aoibhinn Lodge and support services in the Cancer Support Centre. The lodge, located on the grounds of University Hospital Galway, provides accommodation to patients undergoing radiotherapy treatment at UHG and includes facilities for a patient's family member or guest to share. The Cancer Support Centre offers a wide range of services, available free of charge to anyone affected by cancer - patients, carers, family members and close friends. Patient support is the central focus of Cancer Care West. Its main priorities are to equip people living with cancer with the practical and emotional support they need to maintain a peace of mind and quality of life. Cancer Care West also provides cancer awareness & educational programmes and supports research into patient care. Nadine Monaghan (DirectRoute), Gary Kennedy (Lagan Construction). DirectRoute really appreciate the ongoing co-operation being shown by our neighbours and the general public in helping to ensure that the project is constructed as safely as possible for everyone. As the works progress, we are starting to see people using the new motorway as a walking route. There are many hazards still remaining on these nearly completed sections of motorway. With work incomplete, this means that these areas are still not safe and we would ask that you continue to stay away from the construction site. Our mobile security patrols will continue to patrol the site out of hours and they will ask all unauthorised persons to leave the site. Particularly, we are asking parents and guardians to help ensure their children understand the importance of this and comply with it. We also ask that you continue to exercise extreme caution when travelling on the public road and where it interfaces with any roadworks. We ask all walkers and cyclists to use high visibility clothing as "to be seen is to be safe" at these construction site interfaces. 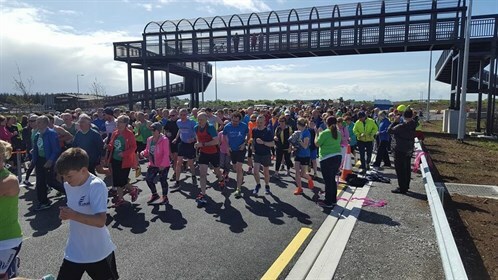 DirectRoute recently made a donation to Galway Hospice Foundation, arising from the Health and Safety incentive scheme run on the M17/18 motorway project. Galway Hospice Foundation provides a wide range of fully-accredited specialist Palliative Care Services to adults & children with cancer and other life-limiting illnesses, as well as providing support to their families and carers. These services which include Home Care, Inpatient Care, Day Care, Bereavement Support and Education, are delivered across Galway city and county and the adjoining islands. 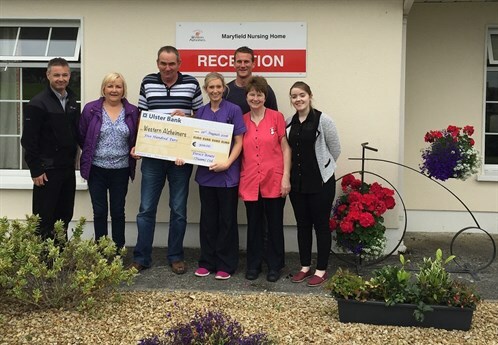 Galway Hospice has become ever more reliant on voluntary donations in the current economic environment. Although the HSE has increased its level of funding for Galway Hospice, they are still required to raise €1.8 million per annum to meet the cost of providing essential patient services. It is projected that demand for specialist hospice inpatient care will double in the next 10 years, and late last year, Galway City Councillors, by majority decision, approved an application by Galway Hospice for the re-zoning of seven acres of land adjoining Merlin Park Hospital. This will now enable Galway Hospice to progress to design and planning stages for the development of a new hospice at that location, which will enable them to meet the projected substantial increase in demand for hospice inpatient care for the people of Galway city and county. For more information or to support Galway Hospice, contact 091-770868 or [email protected]. L-R: Ciaran Blake (Sisk), Padraig Scanlon (Sisk), Orla Feeney (Galway Hospice), Nadine Monaghan (DirectRoute). 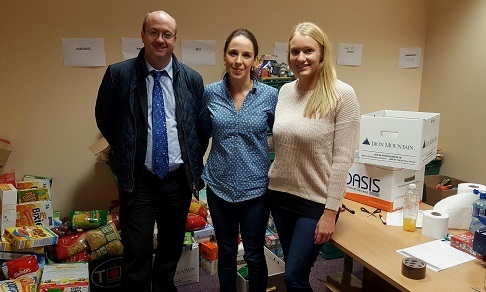 Nadine Monaghan of DirectRoute, along with Jacobs Engineering, Sisk, Lagan Construction, Halcrow Barry and Arup, recently collected 24 boxes of various foods to donate to the Galway Simon Community. We were delighted to receive such fantastic support for such a worthy cause, especially at Christmas time. Since 1979, Galway Simon Community work with people in the areas of homelessness prevention, housing and health & well-being. The Galway Simon Community take a housing first approach. Their work is focused on preventing people from becoming homeless by keeping people in their own homes or helping to resettle people to a new home through mainstream housing. The Galway Simon Community works tirelessly to help people who find themselves in a difficult position. The following are some key statistics from the Galway Simon Community from 2015: 366 people were helped, 113 people were housed and 33 families (including 100 children) were helped. If you would like to donate to the Galway Simon Community, you can do so on their website www.galwaysimon.ie or by contacing 091-381828. L-R: Declan carney (DirectRoute), Amy Lavelle (Galway Simon Community), Fiona Doherty (DirectRoute). 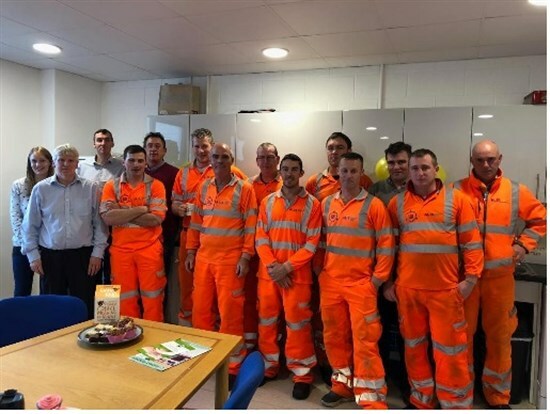 Lagan Construction Group staff recently participated in Movember and held a shave off with all proceeds being donated to galway Hopice Foundation. On the night, 10 beards and 2 heads were shaved which raised a grand total of €4581.61. Galway Hospice provides a wide range of Specialist Palliative Care Services to adults and children with cancer and other life-limiting illnesses. These services, which include Home Care, Inpatient Care, Day Care, Bereavement Support and Education are delivered across County Galway and the adjoining islands. Funding towards the specialist Inpatient services is provided by the HSE, while all other services depend entirely on voluntary contributions. For more information or to support Galway Hospice, contact 091-770868. Alternatively, you can donate on the website www.galwayhospice.ie. Seamus Sorohan (Lagan), Kate Kelly (Lagan), Tommy Fox (Lagan), John Meehan (Galway Hospice Foundation), Bryan McKevitt (Lagan), Caolan Doyle (Lagan), Willie Cunneen (Lagan), Odran Power (3D Personnel), Dermot Gilheaney (Lagan), Declan O'Connell (Lagan) John McNamara (3D Personnel), Oisin Boyle (Lagan). Cancer Care West is dedicated to providing support to anyone affected by a cancer diagnosis in a safe, nurturing and accessible environment. 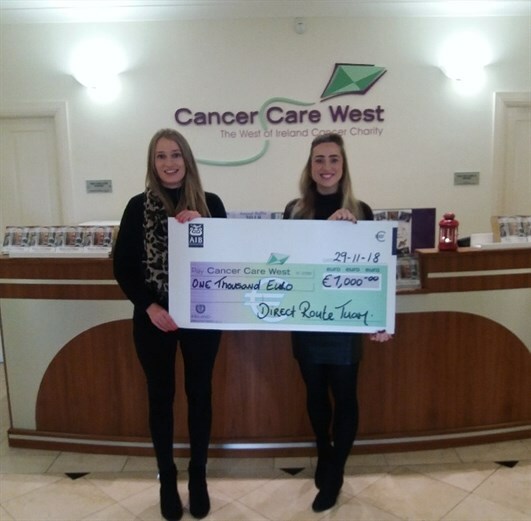 Cnancer Care West complements medical treatment through the provision of residential accommodation in Inis Aoibhinn Lodge and support services in the Cancer Support Services. The lodge, located on the grounds of University Hospital Galway, provides accommodation to patients undergoing radiotherapy treatment at UHG and includes facilities for a patient's family member or guest to share. The Cancer Support Centre offers a diverse range of services, available free of charge to anyone affected by cancer - patients, carers, family members and close friends. Patient support is the central focus of Cancer Care West. Its main priorities are to equip people living with cancer with the practical and emotional support they need to maintain a peace of mind and quality of life. Cancer Care West also provides cancer awareness & educational programmes and supports research into patient care. Rachel Dooley (Cancer Care West), Kathleen Whiriskey (Cancer Care West), Nadine Monaghan (DirectRoute). DirectRoute recently made a donation to St. Oliver's Special School, arising from the Health and Safety incentive scheme run on the M17/18 Motorway project. St. Oliver's Special School caters for pupils from 2 and a half and 18 years of age who have a moderate, severe or profound learning disability. The school also caters for pupils who have physical and sensory disabilities. St. Oliver's also has an Early Intervention Class which caters for children with a diagnosis of Autism between the ages of 2 and a half and 6 years of age. At present, there are 5 classes catering for all students in the school. St. Oliver's Special School is under the patronage of Ability West. The school works with all the health & social partners to provide a well-supported environment for the pupils. This includes physiotherapy, occupational therapy, speech & language therapy, psychology, behaviour support and family support services. The school also follows the NCCA Curriculum Guidelines, delivering a broad, balanced & relevant curriculum to the pupils. St Oliver's Special School has very strong links with the local community. The pupils have the opportunity to participate fully in their local community during their life at school. If you would like to donate to St Oliver's school, you can do so by contacting the school on 093-24402 or by emailing them at [email protected]. DirectRoute recently made a donation to Western Alzheimers, arising from the Health and Safety incentive scheme run on the M17/18 Motorway project. Western Alzheimers is a charitable organisation that provides a complete service of care to families affected by Alzheimers/Dementia in the Western Region of Ireland. Supporting hundreds of families with a 'home from home' philosophy, Western Alzheimers ensures that people living with Alzheimers are cared for in a safe, comfortable and stimulating environment. Western Alzheimers offer the families support and facilities which include Long Stay Residential Care, Respite Care, Day Care and In-Home Care in Galway, Mayo and Roscommon. Western Alzheimers are funded through state support from the HSE and DSP, fund raising activities and philanthropic contributions. 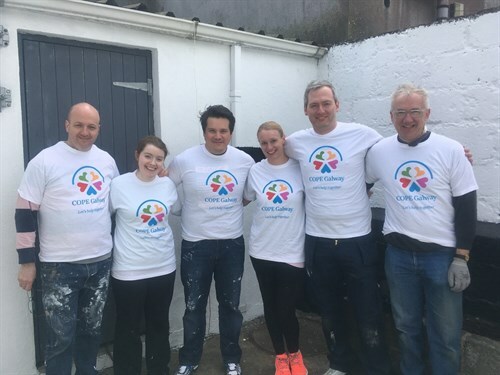 DirectRoute staff recently volunteered to participate in a community activity facilitated by COPE Galway, consisting of some painting and gardening work on a residence. COPE Galway is a local organisation providing supports & services for people affected by Homelessness, women and children experiencing Domestic Violence, and for Older People. COPE Galway helps to Improve Quality of Life in a Home Of Your Own by Supporting Home, Promoting Community and Reducing Isolation. COPE Galway is supported by over 200 volunteers, who aid the organisation in providing its full range of supports across all of its services around Galway. Corporate Volunteers can participate in COPE Galway's "Helping Hands" short term volunteering projects. These projects provide assistance to services to get practical work done such as painting a client's home, planting gardens or washing windows. Working together like this has proved to be very rewarding both for the volunteers involved and the services. Fore more information or to support COPE Galway, contact Tel: +353 (091)778750, by e-mail to [email protected] or via the contact page on the COPE Galway website http://www.copegalway.ie. You will also find them on Facebook. DirectRoute (Tuam) Ltd staff carrying out renovation work on behalf of COPE Galway. 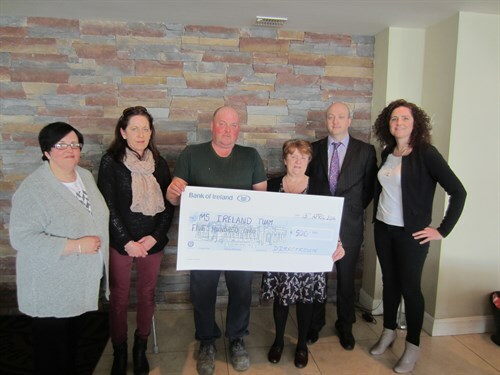 DirectRoute recently made a donation to the Galway's Parkinsons Association, arising from the Health & Safety incentive scheme run on the M17/18 motorway project. 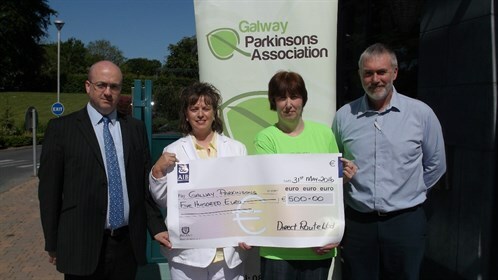 Galway Parkinsons Association are a voluntary group which consists of people with Parkinsons disease, their family members and carers. The Association aims to provide practical support and information to people affected by Parkinsons, including seminars and support in relation to availability of services, grants and the like. They also deliver much needed therapeutic classes for people with Parkinsons in four centres each week. The Association is in existence for 12 years and during that time, the membership has increased significantly and includes all age groups. The Association depends solely upon contributions from the public to enable them to provide their services. All donations are gratefully received and are used directly to provide Physiotherapy and Speech & Languages classes which are vital services to people with Parkinsons. Should you wish to contribute you can do so on their website, details given below. For more information or to support the Galway Parkinsons Association, please do so via the contact page on the Galway Parkinsons website http://www.galwayparkinsons.com. You will also find the Association on Facebook. You can also contact the Association on 087-7783825 Marie Cahil and 086-2566655 Caroline Rushe. Marie Cahill (Galway Parkinsons Association) and Seamus Sorohan (Lagan). 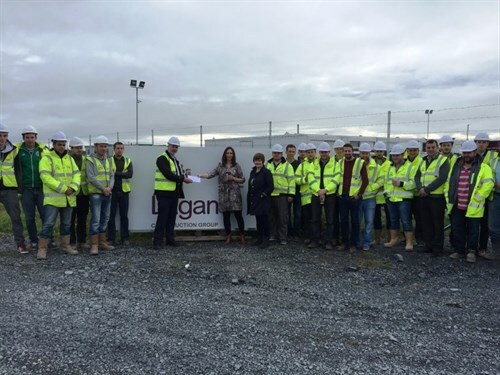 DirectRoute recently made a donation to the Tuam branch of MS Ireland, arising from the Health & Safety incentive scheme run on the M17/18 motorway project. MS Ireland is the only national organisation providing information, support and advocacy services to the MS community. MS Ireland work with people with MS, their families and carers and a range of key stakeholders including health professionals, students and other interested in or concerned about MS. The Tuam branch works with its members in the supporting of all the services noted above and by offering programmes such as Physio, alternative therapies etc. If you are in the Tuam area and have MS or know someone with MS, they would love to hear from you. 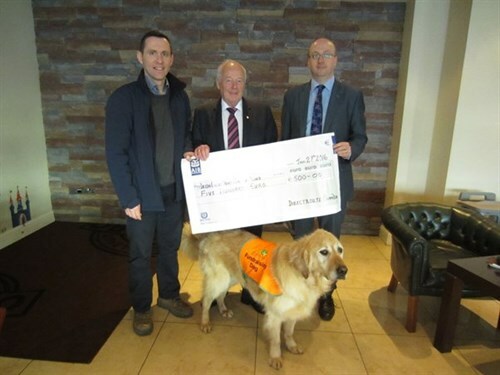 DirectRoute recently made a donation to Irish Guide Dogs for the Blind, arising from the Health & Safety incentive scheme run on the N17/18 motorway project. Irish Guide Dogs for the Blind is Ireland's national charity dedicated to helping persons who are blind or vision impaired and families of children with autism through a comprehensive suite of services to achieve increased mobility and independence and an improved quality of life. Each year Irish Guide Dogs for the Blind must raise in excess of €4.8 million through fundraising to support the delivery of these essential services. 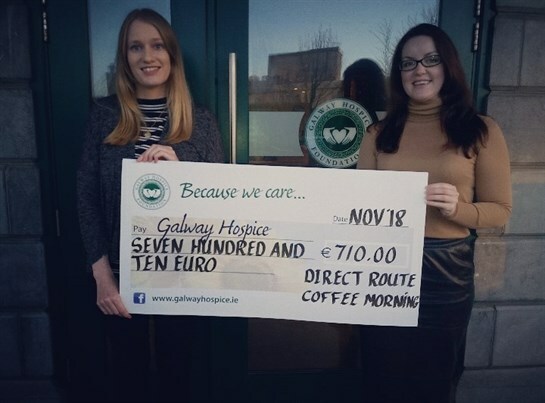 DirectRoute recently made a donation to Galway Hospice arising from a Health & Safety incentive scheme run on the N17/18 motorway project. Galway Hospice provides a wide range of Specialist Palliative Care Services to adults and children with cancer and other life-limiting illnesses. These services, which include Home Care, Inpatient Care, Day Care, Bereavement Support and Education are delivered across County Galway and the adjoining islands. Funding towards the specialist Inpatient services is provided by the HSE, while all other services depend entirely on voluntary contributions. Each year, Galway Hospice must raise in excess of €1.6 million to support the delivery of these essential services which are provided free of charge, for as long as they are needed. 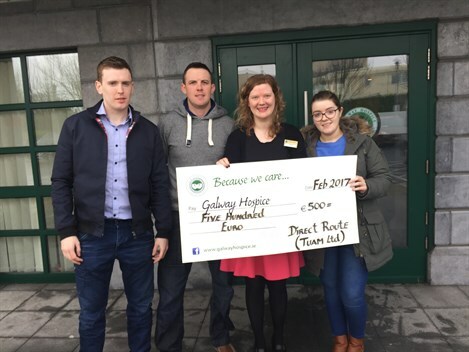 Galway Hospice have become ever more reliant on voluntary donations in the current economic environment. Their HSE funding continues to be reduced while at the same time the demand for their services continues to increase. Due to this increased demand Galway Hospice are actively expanding their existing premises in Renmore to accommodate an additional 6 in-patient beds over the next few months. The cost of this expansion will be funded entirely from voluntary contributions. 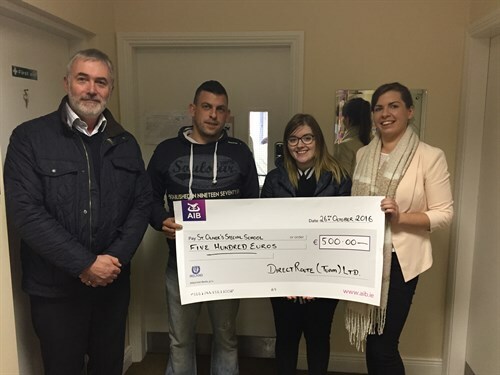 DirectRoute recently made a donation to Pieta House West arising from a Health & Safety incentive scheme run on the N17/18 motorway project. Pieta House West is a suicide and self-harm crisis centre based at Bishop Street in Tuam that serves the whole north-west region. The centre has fully qualified staff providing a professional, one-to-one therapeutic service for people who are experiencing suicidal ideation or engaging in self-harm. Anyone can access the service; it is completely free of charge and a doctor’s referral or psychiatric report is not required. Most people are referred to Pieta House by family members or friends. Since Pieta House West opened its doors just under 2 years ago they have seen and supported upwards of 550 men, women and children, providing up to 15 sessions of counselling completely free of charge. We also offer key person support to the person who is supporting the person in crisis and to date have delivered in excess of 5,300 therapy hours. In the event that anyone is in need of the services offered at Pieta House, whether it is yourself or someone you know, all approaches are dealt with in complete confidentiality. Should you wish to contact Pieta House West the number is 093 25586 and opening hours are Mon, Tue, Thur, Fri 9am to 5pm, Wednesday 9am to 8pm & Saturdays 10am to 2pm. Pieta House is a registered charity (CHY16913) and relies heavily on the support of the public to provide this dedicated and specialised support. Further information on Pieta House West and the services provided by Pieta House in general can be viewed at www.pieta.ie which includes a click and donate facility should you wish to make a contribution. 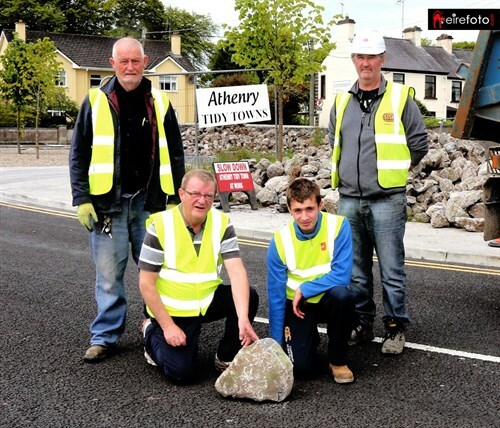 Sisk donated a selection of suitable stone from the stone walls along the Project to the local Athenry tidy towns committee. The committee is building a 1916 commemorative garden in the town. 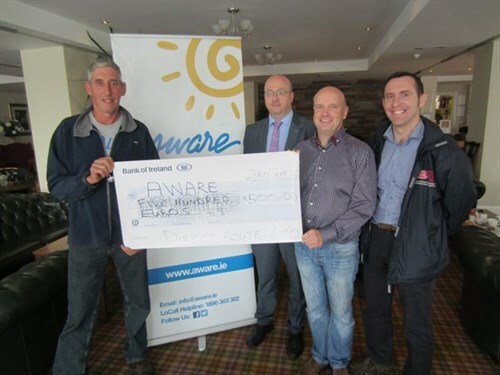 DirectRoute recently made a small donation to Aware arising from a Health & Safety incentive scheme run on the Project. Aware provides information, education, and support services to persons and their relatives that are affected by stress, anxiety, depression, Bi-polar and other mood related disorders. Aware have three support groups close to the corridor of the N17/18 road project – at Ballybane (near Oranmore), Loughrea and Ballinrobe (close to Tuam). The groups meet weekly and are free of charge, there is no requirement for a referral either.